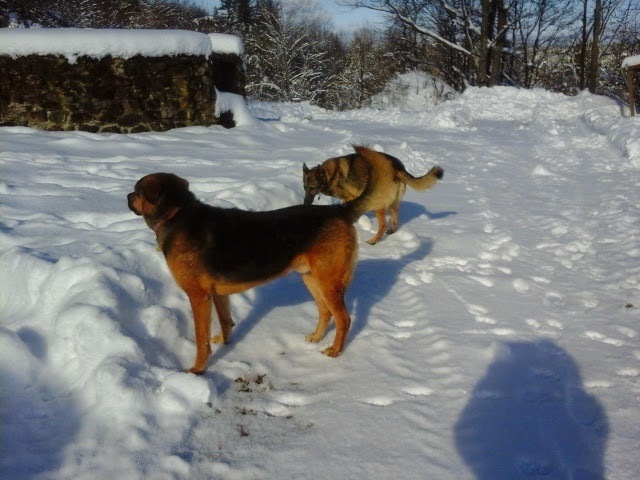 The dogs enjoying a romp in the snow. Today, i thought I would just share some of the list of projects and plans for the homestead. Sometimes it seems pretty overwhelming. But it is just like running a 100 mile race-one step at a time, one foot in front of the other. We will eventually get there. These arent necessarily in order exactly. Hire pest company for bat removal and sealing up the attic. Replace rotted sill on foundation. Repair plaster ceilings and walls and remove wallpaper in interior of house. Remodel duck shed for goats. add screen porch and deck. Some of these things are major, both in expense and effort. some are smaller. We have lots of work ahead of us. This weekend, we are hoping to sit down and plan out some of these things. Having a plan of attack helps to stay focùsed. We need wisdom to know how to proceed. Weather today:about 22 this morning, some sun, snow squalls and wind. Training:push-ups! I am only up to 30. Goal is 100.